This finely crafted wooden piece is worthy of a double-take. While our finest Penguin Super Silk* brand flag is the best there is, the wooden base boasts off an archaic flare. One of our popular wooden table flag set thats elegantly made with a tapered, trapeze-shaped base. An ideal choice for gifting or personal use. Please mention the country name (if other than India), in the order form, before placing the order. Print : Screen-printed with the finest disperse dyestuff that have fast colours and is also UV resistant. Precisely and neatly laser cut at the sides to prevent fraying, it slides over the wooden staff/pole with a sleeve stitched to it. Eco-friendly FSC recommended steam beech wood. Easily holds flag staff firmly within it's punched hole and can easily be removed/replaced/interchanged with another flag. * Penguin Super Silk - Our latest introduction of revolutionary and exceptional quality miniature flags, that are printed with the finest silk screens and supreme quality dyes, which helps to obtain absolute design accuracy and the most vibrant colours. A MUST-HAVE for all corporates, consulates, professionals and quality conscious individuals. WARNING: The finial top(s) attached to the staff, is a small part & hence poses a CHOKING HAZARD, particularly for children under 4 years. Questions about tax? Learn how we calculate tax, if applicable. 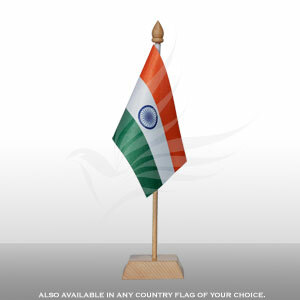 VAT / CST @ 12.5% is applicable on all flags & flag accessories, EXCEPT the Indian national flag. If taxes are applicable to your product, it has already been included. If you are making a purchase which has to be invoiced to a 'Company Name' rather than your personal name, we may get in touch with you later on, requesting for your company's Tin No. VISA Credit Cards | American Express Credit Card | Diners Club Card | JCB Card etc. Debit Card AXIS Bank | Canara Bank | Citibank | Corporation Bank | Deutsche Bank | HDFC Bank | ICICI Bank | Indian Overseas Bank | ING Vyasa Bank | Karur Vysya Bank | Punjab National Bank | State Bank of India , etc. Net Banking ABN AMRO Bank | AXIS Bank | Bank Of India | Bank Of Punjab | Citibank Bank Account Online | Corporation Bank | Federal Bank | HDFC Direct Pay | ICICI Bank | IDBI Bank | Punjab National Bank | State Bank Of India | Union Bank Of India | YES BANK , etc.